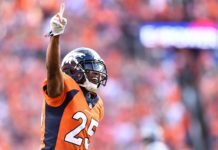 Throwback Thursday: Each week we crack open the content vault at Mile High Sports to bring you a story from yesteryear. Three years ago to the day – Oct. 19, 2014 – the great Peyton Manning broke the all-time touchdown passes record on an eight-yard completion to Demaryius Thomas. It was one of the great moments not only in Manning’s history, but also in Broncos history, as the crowd at Sports Authority Field was treated to yet another milestone that accompanied the Peyton Manning Era in Denver. In retrospect, Manning’s time as the starting quarterback of the Broncos feels like the blink of an eye – so many accomplishments and fantastic moments in such a short amount of time. 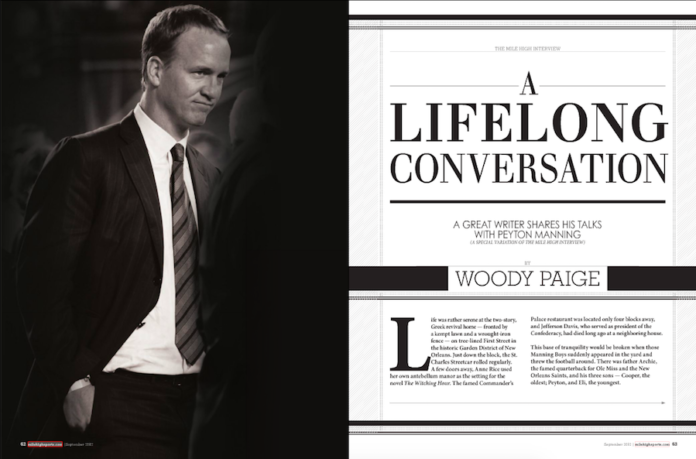 Mile High Sports was fortunate enough to run the following article, a sit-down of sorts featuring greats Peyton Manning and Woody Paige – both products of the University of Tennessee. The conversation took place before Manning ever took a snap. Four and half years later, the Broncos had earned their third world championship. Life was rather serene at the two-story, Greek revival home – fronted by a kempt lawn and a wrought-iron fence – on tree-lined First Street in the historic Garden District of New Orleans. Just down the block the St. Charles Streetcar rolled regularly. A few doors away Anne Rice used her own antebellum manor as the setting for the novel The Witching Hour. The famed Commander’s Palace restaurant was located only four blocks away, and Jefferson Davis, who served as president of the Confederacy, had died long ago at a neighboring house. This base of tranquility would be broken when those Manning Boys suddenly appeared in the yard and threw the football around. There was father Archie, the famed quarterback for Ole Miss and the New Orleans Saints, and his three sons – Cooper, the oldest; Peyton, and Eli The Younger. Eli would complain that Peyton fired the ball too hard and made his hands hurt. The Mannings have become known as “The First Family of Quarterbacks,” “The Kennedys of the NFL” and “The Boys From The Big Easy.” Peyton and Eli have become the first quarterback brothers to win Super Bowls. Eli now has two championship rings after leading the Giants over the Patriots last season. Peyton has played in two, won one over the Bears and lost one to his father’s and his hometown’s team – the Saints. Archie serves as the patriarch and Cooper is a successful businessman. Mother Olivia is the real star among the Mannings, though. She has been a leader in the Battle of New Orleans – the battle to revive the city ravaged by Hurricane Katrina. Wouldn’t it be something remarkable if Eli and Peyton played in a Super Bowl against each other? Guess where this season’s Super Bowl will be held? Only 2.12 miles – six minutes – from the front yard in the Garden District where PM and EM grew up learning to play the game so well. Peyton and Eli can bring back The Streetcar Named Desire. In case you just dropped in on a rover from Mars, Peyton plays for the Denver Broncos this year. After four neck surgeries, he was dumped by the Colts and replaced by Andrew Luck, the greatest thing to happen to Indianapolis since, well, Peyton Manning. I asked Peyton point blank the other day after practice what percentage he is at in his comeback after a year off from football – 90, 95 percent? “I don’t deal in that,’’ he said. Manning wasn’t being brusque. He wasn’t brushing me off. He’s not totally sure, and he won’t be for a while. Come back and ask on New Year’s Eve – a day after the Broncos’ final regular-season game at home against the Chiefs. If Manning is still playing the next weekend, the return would have to be in the 90th percentile, donja think? I’ve had four one-on-one interviews . . . uh . . . conversations with Peyton since he signed (shockingly) with the Broncos as a free agent. After the Broncos’ scrimmage last month at the stadium – which drew an amazing 40,000-plus – Manning stopped signing autographs for a few minutes to participate in a short cluster-press conference. 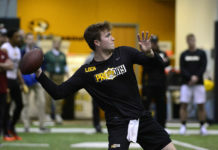 The first question from a media type was about comparisons between the atmosphere at the scrimmage to his time at the University of Tennessee, where the Volunteers routinely draw more than 110,000 spectators to games at Neyland Stadium. Manning sort of smirked in my direction, then said he couldn’t do a comparison – different worlds wide apart. My turn to speak up: “First play?’’ It was a long (incomplete) pass to Demaryius Thomas. Peyton said he had been throwing short passes in the warm-up workout and thought he’d better give the people something they want to see before they got bored, got up and got departed. He was joking – somewhat. When the session was over, he came over, and we talked. What we talked about was I’m going to the Tennessee-Florida football game, and he said – ready for the scoop: “I’m going to the Tennessee-Alabama game. We don’t play that weekend.” (The Broncos have their bye then.) I told him he should attend the Tennessee-Florida game (Sept. 15) because the Broncos are playing that Monday night in Atlanta. “Fly me over to Knoxville in the ‘Around The Horn’ plane, and I will” he said. I told him the program I do daily on ESPN doesn’t own a plane, that he could fly me there in his plane. He doesn’t own a plane, either. Then we laughed that we’d split a plane to Tennessee, where we both went to school. He is the school’s most famous alum. I am not. Thousands of fans are waiting for Peyton to sign their jerseys or touch their fingers, and they were wondering why I was holding him on the edge of the field near the south end zone. I prefer to talk to Peyton casually. “How’s your new house?’’ I asked after practice at Dove Valley one afternoon. “Must be a slow news day,’’ he replied. We have talked about his family. I’ve been covering these Manning Boys since the 1960s when Archie was considered one of three best quarterbacks to play in the South. Maybe Babe Parilli (who used to coach the Broncos and still lives, and shoots his age in golf, in Denver) and Alabama’s Joe Namath would be up there with Archie. Steve Spurrier, a Tennessee boy who played at Florida, would be amongst the cream. He won a Heisman, something Archie didn’t and the sons wouldn’t, either. But Peyton may have been the best there ever was below the Mason-Dixon Line. He lost the Heisman to a defensive back. I had seen him as a kid when I occasionally covered Saints games, and we had lunch in the Tennessee jock dorm during his junior season. He had a brilliant football mind then (and was scholarly, too – graduating in three years) and could talk about quarterbacks who had played over the years (including those at the University of Colorado). I wasn’t surprised when Peyton returned for his senior season. 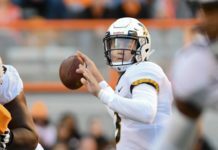 He wanted to win a national championship (the Volunteers lost to Nebraska in the bowl when Manning played on an injured knee), enjoy another year on campus and grab a baton and lead the school band in the “Rocky Top” song after a victory. Perhaps deciding to play for the Broncos will be another of his wisest decisions. Most people weren’t aware that Manning slipped into Denver last year during the NFL lockout. So, I ask, even though Peyton thought he would be returning to the Colts, did his time in Denver plant a seed for his choice to join the Broncos months later. “It certainly didn’t hurt. Ashley and I had been to Colorado often, and always liked it here. At the very least, after Manning was released by the Colts, and when John Fox called him to say the Broncos would like to be on his short list of potential teams, the future Hall of Fame quarterback had more than a passing knowledge of, and interest in, Denver. Denver was Manning’s first stop on his spring tour to select a new home, and, oddly enough, another John – Elway – took him back to Cherry Hills for dinner. Rather than the dog-and-pony show, or dog-and-Broncos show, Elway and Fox did a low-key sell. In Miami and Phoenix Manning’s car was chased by helicopters and hordes of media. Peyton told me he felt “comfortable” in Denver, just as he had felt comfortable in Knoxville, Tenn., when he picked the Vols over Notre Dame, Florida State and his father’s school – Mississippi. Peyton, Ashley and their 17-month-old twins, Mosley (girl) and Marshall (boy), lived for a while during this summer at Mike Shanahan’s house, then bought one of their own (sort of a Louisiana-style mansion). They are here to stay for a while – three years, four, maybe five. Peyton said he wasn’t looking that far into the future. At the moment, with the season opening, “I want to do my job to help this team win, whatever role that is. Obviously, that role is protecting the ball, moving the ball down the field, scoring points, sharing knowledge with all our players, our receivers, our quarterbacks. “So, I always feel that I can help make a team better by working hard, sharing knowledge and experience I may have. Brock [Osweiler] (the team’s second round draft choice and heir apparent) and I meet every day together with Caleb [Hanie] and Adam [Weber], and we have an open-forum discussion out there. I’m not their coach. Adam Gase is the [quarterbacks] coach. But sometimes they have questions for me, and I’m certainly willing to answer. Peyton and I have had a serious discussion about the “hurry up” offense. Henry Ford didn’t invent the car, but he popularized it. Peyton Manning didn’t invent the “hurry up,” but he made it renowned and recognized; it’s a now staple of pro and college and high schools all over the country. But “hurry up” offense is a misnomer. More like “hurry up and wait” offense. Most teams spend 15 seconds in a huddle six yards off the line of scrimmage. Manning would prefer to spend that time at the line examining the defense, point out who’s coming and going, moving his receivers and running backs and changing plays, or just confusing the defenses. It’s as if he is a conductor with a baton. (Remember Peyton directing the Tennessee band?) Manning usually waits until just before the play clock expires to actually have the ball snapped – except in the two-minute drill, when the team is footballs-out in actions. Since Dan Reeves was the Broncos’ coach, I’ve recommended that the team run a shotgun, no-huddle brand of football. I once suggested Reeves let Elway call his own plays. Before an exhibition in San Francisco, Reeves scowled at me and said: “You got your way. Elway is going to call the plays this week.” I honestly don’t remember if it was 1991 or 1994. In both games, the Broncos didn’t score a touchdown and were blown out. Afterward, in a crowded hallway in Candlestick Park, Reeves snarled, “See.” Reeves went back to calling the plays. I suggested a no-huddle, full-time shotgun hurry-up to Shanahan, but he wanted to emphasize the running game more. Along came Terrell Davis to help Elway, and the Broncos went to Super Bowls. I asked Josh McDaniels his first summer if he intended to use a hurry up offense. “Not in the first game, but by the Cleveland game (second game) you’ll set it,” the young coach said. The Broncos never unveiled a hurry-up. Generally, it was a hopeless-down offense. So, Peyton and the quote, unquote hurry up finally have become the Broncos’ offense – and should, as some of us imagined all those years, create special problems for defenses trying to gasp the thin air and trying to grasp what Manning is doing with all that pointing and dancing and shouting and surveying just before the play starts. Actually, Peyton Manning’s sense of urgency likely began when he was 10 or 12, in the front yard of the tidy, tranquil house in the Garden District of New Orleans, and he was in a hurry to throw another hardball pass and make younger brother Eli’s hands hurt because he wanted to be the best quarterback there ever was.